Do you want to be seen today? We want to help you Stop the Pain ASAP. 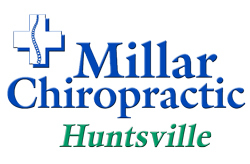 Chiropractic Huntsville AL, Millar Chiropractic - Huntsville AL (Downtown) is our clinic that specializes in Pain. If you're in PAIN, we can see you today (in most cases). Tell the office when you call that you're in Pain and need to be seen today . Call now (256) 539-2000 . Call today if you're in pain! A Free Consultation is just that. A 15- 20 minute meeting to talk about your problems and our possible solutions. The Millar Chiropractic - Huntsville AL (Downtown) clinic is your Huntsville Chiropractic Clinic. We're located right off the South Memorial Parkway at the Clinton Ave exit. In fact if you get off on the Southbound Clinton Ave exit we are the building in the loop off the exit. We're located at 2021 Clinton Ave W Huntsville AL 35805. At Millar Chiropractic - Huntsville AL (Downtown) we have highly experienced Chiropractic veterans ready to serve you today. 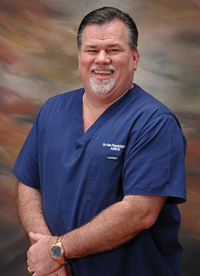 Dr. Ken Randolph, DC Chiropractor is the Senior Millar Chiropractor at the Millar Chiropractic - Huntsville (Downtown) clinic and Sr VP Personal Injury of Millar Chiropractic Clinics. Dr Ken as he likes to be called is a former member of the Alabama State Board of Chiropractic Examiners who regulate and enforce the laws governing Chiropractic. He was on the Board for 11 years and just rotated off. He served longer than any other board member in the State of Alabama. It is a rarity anytime in our profession to have a fourth generation Chiropractor. We are proud to announce that we have such an individual, Dr. Ken Randolph. Dr. Ken can trace his Chiropractic roots back to the family who started Chiropractic in 1895. Dr. Ken is a graduate of Life University. Dr. Ken has practiced for the past 18 years in Guin, Alabama with his father, Dr. Gary Randolph, who has been in practice since 1960. Dr Millar says, "Dr Ken and I went to school together at Life University, College of Chiropractic. We had the same professors and same training. Even then, he was one of the best adjusters in school and now well he is just amazing. I like to call his adjustments silky smooth." Come see for yourself. Dr. Ken Randolph DC is in network a provider for BCBS of AL, Federal BCBS and PeeHip. He accepts Medicare and most insurance. 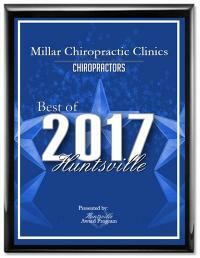 Want on of the Best Chiropractors Huntsville, well Millar Chiropractic Clinics Huntsville was the recipient of the 2015, 2016 and 2017 Best of Huntsville, Chiropractor award. 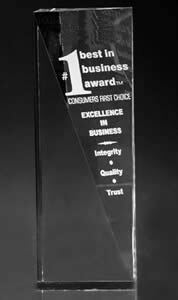 We were also given the #1 Best in Business Award, Chiropractor for five years in a row 2011-2015 for Huntsville and North Alabama. But the award we most covet is being your Chiropractor and helping YOU get out of and stay out of Pain. Office hours: 8-12 p.m. and 2-6 p.m. Monday through Friday. Closed Thursday afternoon at 12 p.m.
Next time you need a Chiropractor Huntsville AL call Millar Chiropractic - Huntsville AL (Downtown) your full service Huntsville Chiropractic Clinic. Huntsville Chiropractic & Nutrition Center, LLC d/b/a Millar Chiropractic - Huntsville Al (Downtown). Each office independently owned and operated. Huntsville Chiropractic & Nutrition Center, LLC. practices as a separate group practice from the other Millar Chiropractic Clinics and their respective companies. Millar Chiropractic Associates, Inc. is the management and marketing company for Millar Chiropractic and Millar Chiropractic Clinics. The Millar Chiropractic logo, Millar Chiropractic and Millar Chiropractic Clinic is used here with permission. FREE Consultation* - A Free Consultation is just that. A 15- 20 minute meeting to talk about your problems and our possible solutions. No Exams preformed. No Chiropractic treatment given. Should the person receiving Free* services as outlined above be accepted as a patient of Millar Chiropractic Clinics then additional regular charges for treatment will be incurred in individual cases as needed for related services. Some patients are not allowed to receive reduced fee or free chiropractic or medical services. It is up to YOU to determine if you can receive free services. This offer applies to new consultations only and does Not apply to Existing patients, Personal Injury or Workers Comp consultations. For all services, results vary in individual cases. Cash Value of Free Consultation $0.01 Cash value of Free Massage $0.01.